Fortress of the Witch is often called RiverChess and is a game that draws on a number of ideas from several games based on Western Chess and Chinese Chess. Fortress of the Witch is the Tie-break game for The Middle Trilogy (see Games by Groupings) but can also be played as a stand-alone game. Â© Copyright G. Nicholls 2015 The Players and Sides: The Chief Woodsman who plays: The Inhabitants of The Woodland Kingdom (Northern Area) And The Woodsman of the Witch who plays: The Inhabitants of the Witch (Southern Area) Timed by TigerClocks The Settings: The Ancient Woodland region of The Great Forest, which surrounds: The Woodland Kingdom, which consists of: â€¢	The Northern Area â€¢	The Southern Area â€¢	Woodland River, which separates the two Areas and has many bridges Within the Northern Area is Woodland City Within the Southern Area is the Fortress of the Witch The Board & Inhabitants: The board consists of nine ranks and seven files with a River of one rank across the middle and a City coloured green and a Fortress coloured darkly â€“ both cover 3 x 3 squares in each Area. The board is somewhat based on the Chinese Chess board and called the â€œWoodland Kingdomâ€ board, though squares and not intersections are used. The board with initial deployment and names of the Inhabitants (pieces) is as shown and is called The Dragon Formation: Notes: â€¢	Squares are called positions. River Positions can also be called Bridges. â€¢	The algebraic notation of the board is: files are designated A to G (West to East) and ranks are designated 1 to 9 (South to North). â€¢	The Inhabitants are distinguished by prefixing them with â€œWoodlandâ€ for the Northern Area or by suffixing them with â€œof the Witchâ€ for the Southern Area - for example a Woodland Lancer or a Pikeman of the Witch except the Count and the Dark Witch are named specifically as such as are Knighted Pikemen and Pike Commanders. â€¢	The Woodland Kingdom is situated on a tributary river of that of the River Territories of Wing. Overview and Object: The time is shortly after Wing (If) As the Battles of The Middle Trilogy, which had lasted perhaps a thousand or more years, were approaching their inconclusive end in the River Territories (see Wing), a young King and his Queen were crowned in the not too distant Woodland Kingdom upriver. The Battles and Struggles of The Middle Trilogy were widely dispersed and had numerous and disparate causes, some of which were resolved long ago, but those that remained seemed to come to a head in the dispute over the river running through the middle of the River Territories. This river is part of the longest and largest river in New-Earth and though it and its many tributaries have a number of names in the various areas it passes through it is known overall as The Great River and it finally runs into the eastern side of Trafalgar Ocean (see Dragon - though this is not shown on the board). The river is thought by many to have great healing and other beneficial qualities and the richest concentration of these qualities is in the tributary that runs through the Woodland Kingdom. Thus it was that as the Battle in the River Territories finished, attention began to be switched to further upriver; and secretly to the Woodland Kingdom came a renegade and Dark Witch from the River Territories who had discovered the great concentration of beneficial qualities in its river. At the far south of the Woodland Kingdom was a large and ancient Fortress (which was similar in appearance to a huge Castle) dating back to well before The Great Change (see Chronology in Games by Groupings). This uninhabited Fortress was dark and forbidding and generally avoided by those of the Woodland Kingdom due largely to the frightening legends of its distant past about a Noble simply called The Count. It was to this Fortress that the Dark Witch came and made of it her base of operations. It was not long before the Witch was regularly bathing in the river and then a distinguished looking man of middle years (the Witch herself was of Middle years) had joined her. Had anyone at that time taken much notice of them they would have soon been aware that they were looking younger and fitter almost by the day and soon both (through enchantments) were gaining great influence amongst some of the Kingdomâ€™s inhabitants. Whilst all this was happening it seemed the opposite was happening to others of the Kingdom, in particular the Queen and to some extent the King. The Queenâ€™s health and fitness seemed to be declining, despite wearing the Northern Light (see note later), and there was a reduction in the Kingâ€™s heretofore exceptional physical strength. This was a great mystery to the healers of the Kingdom, who were considered amongst the most knowledgeable in their field, for both were young with no previous problems and like all those of the Kingdom were benefited by the health giving qualities of the river. But the Count (as the Witchâ€™s companion had now declared himself) and the Witch knew exactly what the cause of the Queenâ€™s problems were, for their (mis)use of the river had a rebounding and negative effect on the Queen and others. Both the Witch and the Count also knew full well that to maintain their well-being required continuous use of the river and that sooner or later they would have to forcibly usurp the rule of the Kingdom. To this end the Witch and the Count put much effort into (enchantments) winning over as many of the Inhabitants as possible. These activities of the Count and Witch could not be hidden for very long though and so it was that the King, Queen and their advisers turned their attention towards them and issued a Royal summons requiring them to explain their activities; but the Count and the Witch realised that they would certainly be arrested and tried for serious crimes and so gathered their supporters and prepared for the Struggle(s) that would finally bring The Middle Trilogy to an end.... The object of each player is to Lock-up (Checkmate) the opposing Woodland Queen or Dark Witch and this wins the Struggle(s). A Note on the River: None of the Inhabitants (Pieces) can directly cross the (Woodland) River from one of the two Areas into the other Area either by way of moving or capturing â€“ the Inhabitants must first move to or capture on a position (bridge) on the River with their usual move or capturing move. The effect of this rule (called the rule on crossing the River) on each type of Inhabitant is identical to that explained in Wing and RiverQi. The Inhabitants that the rule applies to are noted later. Moves & capturing powers of the Inhabitants: The moves and capturing powers of most of the Inhabitants have been described under other games and so where this is the case the appropriate game is referred to though there is mostly a brief description here also. The following applies to what is called the â€œLevel variationâ€ of the game. The Woodland King and The Count are identical in powers to those of the Viscounts as described in Touchstone (see Springboard) - these powers are those combined of a Western Chess Bishop and a Western Chess non-royal King. The rule on crossing the River means that the King and the Count must move and capture as follows: 1. If either are situated on a position in either of the Areas then he can only move to or capture on a position within that same Area or the River, i.e. he cannot move to or capture on a position in the other Area. 2. If either are situated on a position on the River then he can move to or capture on a position in either Area or on the River itself, i.e. the whole board. Whilst he stays situated on the River then, the possibilities of moving or capturing are not restricted. 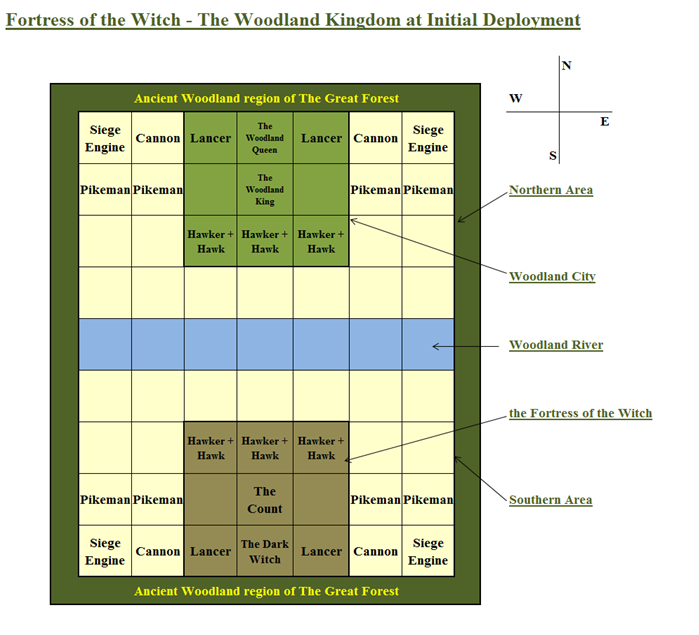 The Woodland Queen and The Dark Witch are mostly similar to the Generals in Chinese Chess except that they can move to or capture on any adjacent position within Woodland City or the Fortress of the Witch. They are confined to their City or Fortress (no other piece is) and cannot move or capture outside of these. The Queen and the Witch may face each other along an otherwise unoccupied file - the two Generals may not in Chinese Chess. The Queen wears the Northern Light around her neck (explained later). The rule on crossing the River has no direct effect on the Queen or the Witch. Lancers are identical to the Kingâ€™s Lancers of TigerChess, and their moving and capturing powers are described in this game - they can move or capture one or two squares vertically or horizontally and they can jump. The rule on crossing the River has an effect on a Lancer: 1. If a Lancer is situated on a position in either of the Areas then he can only move to or capture on a position within that same Area or the River, i.e. he cannot move to or capture on a position in the other Area. 2. If a Lancer is situated on a position on the River then he can move to or capture on a position in either Area or on the River itself, i.e. the whole board. Whilst a Lancer stays situated on the River then, the possibilities of moving or capturing are not restricted. A Siege Engine is identical to a Chariot in Chinese Chess and a Rook in Western Chess. How it moves and captures is described in a number of games e.g. Wing. The rule on crossing the River means that a Siege Engine must move and capture as follows: 1. If a Siege Engine is situated on a position in either of the Areas then it can only move to or capture on a position within that same Area or the River, i.e. it cannot move to or capture on a position in the other Area. 2. If a Siege Engine is situated on a position on the River then it can move to or capture on a position in either Area or on the River itself, i.e. the whole board. Whilst a Siege Engine stays situated on the River then, the possibilities of moving or capturing are not restricted. A Cannon is identical to a Cannon in Chinese Chess. How it moves and captures is described in Wing. The rule on crossing the River also applies to the Cannon and is somewhat repeated as follows: 1. If a Cannon is situated on a position in either of the Areas then it can only move to or capture on a position within that same Area or the River, i.e. it cannot move to or capture on a position in the other Area. 2. If a Cannon is situated on a position on the River then it can move to or capture on a position in either Area or on the River itself, i.e. the whole board. Whilst a Cannon stays situated on the River then, the possibilities of moving or capturing are not restricted. If capturing, it makes no difference to the rules of capturing whether the screen is situated on the River or in an Area. A Hawker is described in Wing but is repeated here. A Hawker differs in â€œpromotionâ€ from his counterpart, a Soldier, in Chinese Chess. He moves to and captures on one position vertically forwards, as does a Soldier, until he has reached the opposing Area on his sixth rank when the following takes place: â€¢	Each Hawker carries with him a Hawk which is a trained hunting bird and will attack opposing Inhabitants situated in the opposing Area. â€¢	The King/Queen and the Count/Witch have instructed all their Hawkers to release their Hawks upon reaching the opposing Area and so this happens automatically. â€¢	The Hawker releases his Hawk and retires from the battle and his Hawk is left by himself on the position that the Hawker was on. â€¢	The released Hawk can exercise his moving and capturing powers commencing on the next move. Notes: If a Hawker is captured before releasing his Hawk, the Hawk is also captured. A Hawkâ€™s moving and capturing powers cannot be used before he is released. The rule on crossing the River has no direct effect on a Hawker. A Hawk differs much from his counterpart, a promoted Soldier, in Chinese Chess. A Hawk is confined to the opposing Area, which is where he is released, and he cannot move or capture outside of this Area. A Hawk can move along any path that is vertically forward, vertically backward or horizontal and land upon any unoccupied position along one of these paths regardless of any intervening Inhabitants â€“ this moving ability is called flying. When capturing, however, a Hawk can only capture on one adjacent position that is vertically forward, vertically backward or horizontal i.e. a maximum of four possible positions. The rule on crossing the River has no direct effect on a Hawk. A Pikeman is identical to a Pikeman as described in TigerChess or a Pawn of Western Chess except for promotion occurrences. He still has the usual optional two position initial move and the en passant rule applies (where a promoted Pikeman may capture but does not have to with this move). Upon crossing the River and reaching his sixth rank he is automatically promoted to and called a promoted Pikeman. The rule on crossing the River has no direct effect on a Pikeman. A promoted Pikeman can move to or capture on any of the three forward positions to him i.e. one position vertically forwards or either of the two diagonal positions forward by one position (hence the slight difference in the en passant rule). The rule on crossing the River has no direct effect on a promoted Pikeman. A Knighted Pikeman and Pike Commander: Upon reaching his end (ninth) rank a promoted Woodland Pikeman is automatically Knighted whereupon he has identical powers to an Earl as described in Touchstone (see Springboard) - these powers are those combined of a Western Chess Knight and a non-royal Western Chess King. He may not stay as a promoted Pikeman. The same occurrence with same powers applies to a promoted Pikeman of the Witch but he is called a Pike Commander. The rule on crossing the River applies: 1. If a Knighted Pikeman/Pike Commander is situated on a position in either of the Areas then he can only move to or capture on a position within that same Area or the River, i.e. he cannot move to or capture on a position in the other Area. 2. If a Knighted Pikeman/Pike Commander is situated on a position on the River then he can move to or capture on a position in either Area or on the River itself, i.e. the whole board. Whilst a Knighted Pikeman/Pike Commander stays situated on the River then, the possibilities of moving or capturing are not restricted. General rules & notes: The game is played mostly with generally accepted rules and best practice of Western Chess; the following apply: 1. Points are three for a win and one for a draw when played as a stand-alone game. 2. The Woodsman of the Witch moves first and then each side moves alternately. 3. Retired Hawkers are removed from the board and placed with captured opposing Inhabitants whom they guard. 4. The usual colours are pastel green and other Woodland colours for the Northern Area Inhabitants and dark red and brown and similar for the Southern Area Inhabitants. All Inhabitants (pieces) are, as with all Tigerâ€™s-Eye board games, three dimensional and are not disc form. 5. The â€œchasing rulesâ€ of Chinese Chess do not apply. 6. Draws are based on the rules for Western Chess and include Stalemate and Threefold repetition of moves/position. 7. Perpetual check is allowed. 8. Players should state â€œcheckâ€ if the opposing Woodland Queen or Dark Witch is in Check, though this is not compulsory. 9. Boards should be much larger than usual Chess boards and can have suitably picturesque effects. 10. The Conversion from Stalemate to Checkmate rule does not apply to this game. 11. Pieces are realistic looking. 12. Clocks are TigerClocks â€“ Double countdown and would typically have such times as that for games such as TigerSquares. 13. In the Level variation Woodland City and the Fortress only affect the movement of the Queen and Witch as described and not any other piece. 14. When played as a Tie-break game for the Middle Trilogy, who has which side is decided by the roll of a standard dice or coin. 15. When played as the Tie-break game for The Middle Trilogy then the Points scored above are Nominal Points for the individual game, but a win scores the winning side the usual three Game Points as a Win Bonus. If, however, the game is a draw then the â€œHigh variationâ€ must be played â€“ this variation only scores Nominal Points as a stand-alone game. The differences of this variation to the Level variation are as follows: a). The players have the same sides as they played in the Level variation but the Chief Woodsman moves first. b). The Count is called the High Count and his powers are those of a Duke as described in Touchstone (see Springboard) - these powers are those combined of a Western Chess Rook and a non-royal Western Chess King. The Kingâ€™s powers are unchanged as described in the Level variation. The rule on crossing the river is the same for the High Count and all others as before. c). No opposing piece may enter and land on a position inside the Fortress of the Witch except the Woodland Queen. This does not impair the actions from outside the Fortress by any Woodland pieces of a Check or Checkmate to the Witch â€“ this ability is empowered by and can be enforced by The Northern Light. The Fortress does not act as a block on pieces moving or capturing across or over it but only on opposing pieces from alighting on (inside) it and the Cannonâ€™s screen may be inside the Fortress. The Fortress can be described as Shielded or called the Shielded Fortress or the Dark Fortress. d). The Woodland Queen is called the (free) Woodland Queen and she is not confined to her City or to any part of the Kingdom (board) and she can move to or capture on any adjacent position â€“ this ability is also empowered by The Northern Light. The rule on crossing the river still has no direct effect on the Queen. The Witch is still confined to her Fortress as described in the Level variation. e). The Queen can attack the Witch but the Witch cannot attack the Queen â€“ this ability is also empowered by The Northern light. As can be seen it is possible for the Queen to Checkmate the Witch on her own. The Queen is still otherwise vulnerable to Check or Checkmate as usual. f). Scores for the individual game are 4-0 Nominal Points for a win by the Chief Woodsman and 2-0 Nominal Points for a win by the Woodsman of the Witch. A draw is classed as a lesser but sufficient win for the Chief Woodsman and the score is 2-0 Nominal Points to the Chief Woodsman. The Win Bonus Game Points awarded are four or two in accordance with the Nominal Points awarded. g). Clock settings are the same as for the Level variation. 16. Abbreviations if required are: â€¢	The Woodland King - WKG â€¢	The High Count - HIC â€¢	The (free) Woodland Queen - FWQ â€¢	The Count - TCT â€¢	The Woodland Queen - TWQ â€¢	The Dark Witch- TDW â€¢	A Knighted Pikeman - KNP â€¢	A Pike Commander - CMR â€¢	A promoted Woodland Pikeman - PWP â€¢	A promoted Pikeman of the Witch - PPW â€¢	A Woodland Pikeman - WPN â€¢	A Pikeman of the Witch - PWH â€¢	A Woodland Lancer - WLR â€¢	A Lancer of the Witch - LWH â€¢	A Woodland Siege Engine - WSE â€¢	A Siege Engine of the Witch - SEW â€¢	A Woodland Cannon - WCN â€¢	A Cannon of the Witch - CWH â€¢	A Woodland Hawker - WHR â€¢	A Hawker of the Witch - HKW â€¢	A Woodland Hawk - WHK â€¢	A Hawk of the Witch - HWH â€¢	The Northern Light - NORTH 17. The future daughter of the Woodland King and Queen is the Woodland Princess of Dragon. Scores table: The table below is shown to clarify the scoring possibilities: A Note on the Northern Light: At the commencement of the Struggle(s) the Queen has mostly recovered from the ill effects of the misuse of Woodland River and the King has recovered a good deal of his strength â€“ both are improving. The Queen wears around her neck the Diamond Earthstone known as the Northern Light (also see Dragon and The Jewel Series) which was given to her by the King after his crowning. This Stone has great protective powers against physical attack and other harm, but against the combined and dark powers of the Count and Witch it must be partially realigned and so in the Level variation its powers are used to hold back the full powers of the Count. In the High variation the Witch has used her remaining powers to add Shielding to her Fortress and so the Queen has used the powers of the Northern Light to partially counter this but cannot also hold back the Countâ€™s full powers. A Note on Sides: If a games(s) of Dragon and/or Stones of Fortune are played in a connected way to Fortress of the Witch, e.g. during a match (see Games by Groupings), then the Players (Individuals or members of a Team) must play the same North/South Sides throughout all the Games and so for example the Forest OverLord of Dragon would be the same Player or Team as the Chief Woodsman as would be the Light Stone Master of Stones of Fortune (see Chess from Draughts etc.). This rule does not of course apply to Leopard Princess (see Chess from Draughts etc. ).